I’m hoping that by posting this recipe, I’ll be making my sister Lexi really, really, really inspired to start making this for herself. It’s her favorite – probably in the top five things that I make that she loves the most. And accomplished chef and baker she may be, she always cons me into making it for her. Maybe it’s like how I feel about a good grilled cheese – I can make it for myself, but it tastes so much better when someone else makes one for me. Come to think of it, Lexi makes my favorite grilled cheese of all time – Tilamook cheddar, feta cheese and a tomato on slices from a pullman loaf. Maybe we were meant to be sisters. 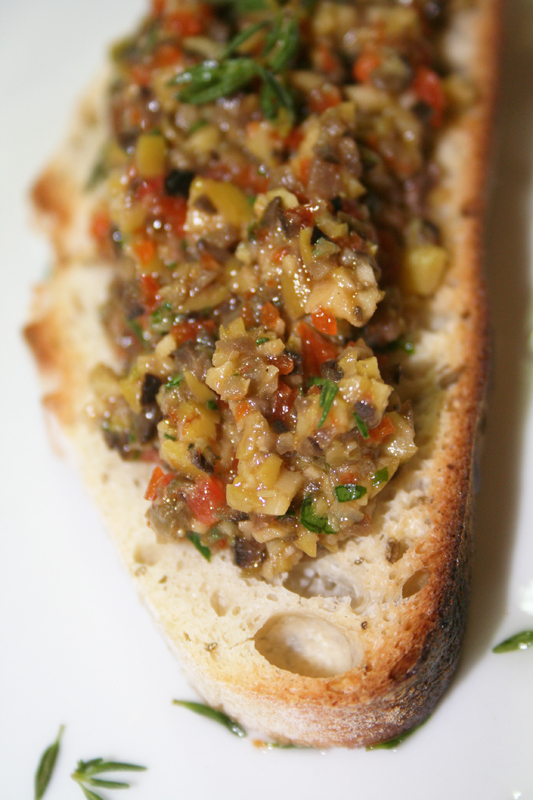 There are very few ingredients in this bruschetta, so you have to use the best ingredients possible. Fresh ripe tomatoes, leafy basil and fruity olive oil make all the difference. This topper is killer on toasted ciabatta, baguette rounds brushed with olive oil and baked, or even focaccia. If carbs aren’t your thing, try it atop chicken paillard (or a simply grilled chicken cutlet) and a handful of arugula. It’s a bistro meal without a ton of calories. You can also toss this bruschetta with boiled, cooled potatoes and blanched string beans for my absolute favorite salad of all time (similar to my Potatoes Vinaigrette). 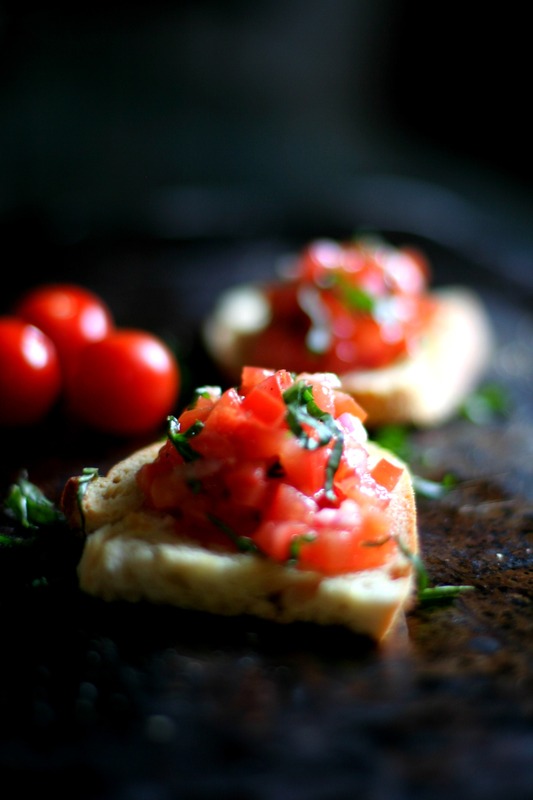 This bruschetta doubles and triples easily – make enough for friends, but not enough for leftovers. It’s best eaten the same day before the tomatoes become soggy and too acidic. It’s a carpe diem kind of recipe, so tuck in post haste. Add tomatoes, salt, pepper, shallot and basil to a bowl. Toss with olive oil and vinegar. Taste for seasoning. 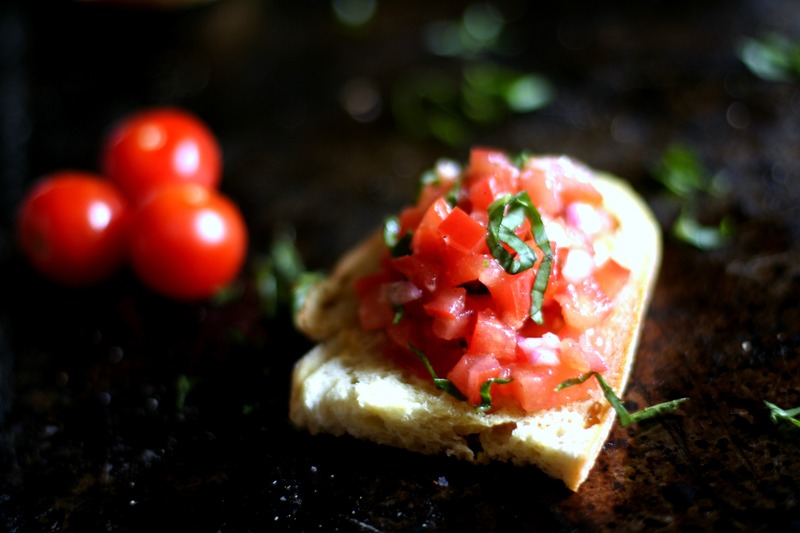 Top crusty slices of bread with a few tablespoons of bruschetta and serve with sprigs of basil for garnish. Or put out the bread and bruschetta and let people assemble for themselves. For non-vegans, you can serve bruschetta topped with slices of buffala mozzarella as an added treat. This salad is inspired by the delicious concoction that my buddy Maureen used to whip up for all of us working at my old job back in the day. Perfectly tangy, crunchy, and sweet – it was probably the most requested item at our potlucks and parties. Remind me to beg her for her recipe sometime. Right around the time I left for NYC, my aunt gave me a copy of the Junior League of Yakima Cookbook, and lo and behold, they had a version of Maureen’s salad. Their version had a few unusual additions, to include parsley, candied almonds and tabasco. They also used a lettuce blend as opposed to the traditional iceberg. Fast forward a bit, and out of sheer necessity and chronic cravings for interesting salad options, I came up with the following “hacked” version of the two recipes. I ditched the candied almonds, added some splenda, and used a mix of extra crisp lettuces – frisee became the ace in the hole, adding both crunch and texture. Topping off the whole shebang is a lovely toss of black and white sesame seeds. The bright mix manages to make me grin just at the sight of it. A nourishing enough meal on its own, this salad is also a great accompaniment to slices of Crispy Ginger Chicken. In a large salad bowl, toss the greens, scallions, celery, almonds and oranges. Set aside. Mix together in a small bowl the olive oil, rice wine vinegar, splenda, salt and white pepper. Pour the dressing on the sides of the salad bowl (a Thomas Keller trick to perfectly saturate each green with an even amount of dressing) and toss. Top the salad with the sesame seeds. Serve to deserving lovelies.